Schneeberger serves the O.E.M. market in various industries worldwide – from machine tool, solar technology and semiconductor technology to electrical engineering and medical engineering and others. Our Linear bearings, profiled linear guide-ways, measuring systems, gear racks, slides, positioning systems and mineral casting are all part of our extensive product offering and manufacturing capabilities. A.MANNESMANN has been part of the Schneeberger group since October 2017. A.MANNESMANN is a leading supplier for the production of high precision ball screw drives, telescopic actuators and drill spindles. 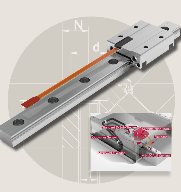 For more information contact Schneeberger Inc.